Why are women so fascinated by clothes, and how does our relationship with schmutter affect the way we are perceived? 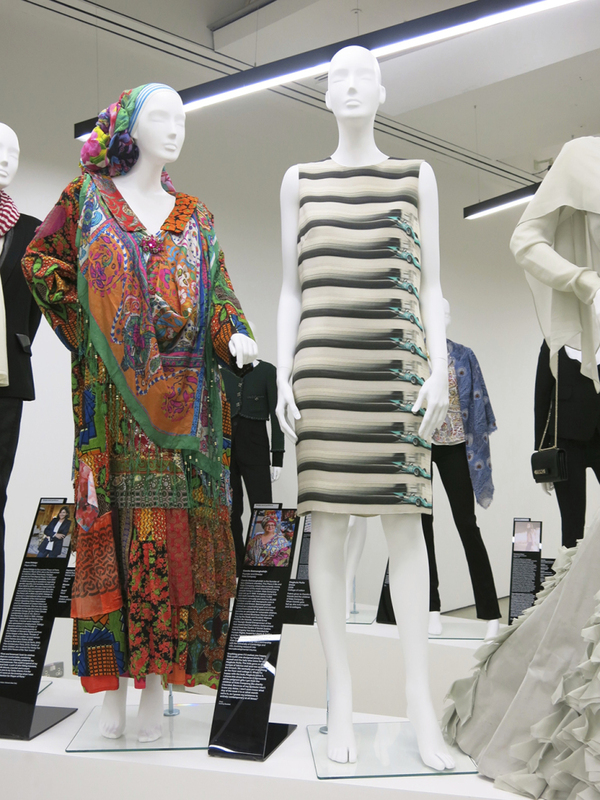 Women Fashion Power at London’s Design Museum showcases one outfit from each of twenty-six “exceptional” women. All are leaders in their field and understand that “the clothes they wear are a part of the way that they communicate to the world.” Professional women engage with contemporary fashion “as a way to express individuality, a sense of style and empowerment.” Alongside each display is a personal description of each outfit by the wearer, telling why they chose the clothes in question and what they mean to them. 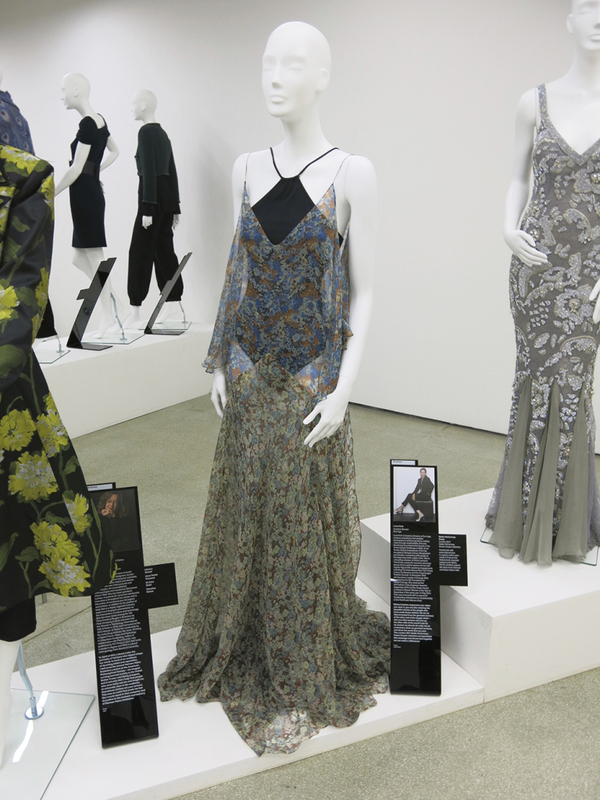 “This is not a fashion exhibition,” says co-curator Colin McDowell. Intelligent women from the fields of politics, business, culture and fashion usually put a lot of thought into what they wear and can afford to take their pick from the best designers in the world. Their clothes are not merely an outward reflection of their personality, but also the manner in which they wish to project themselves. 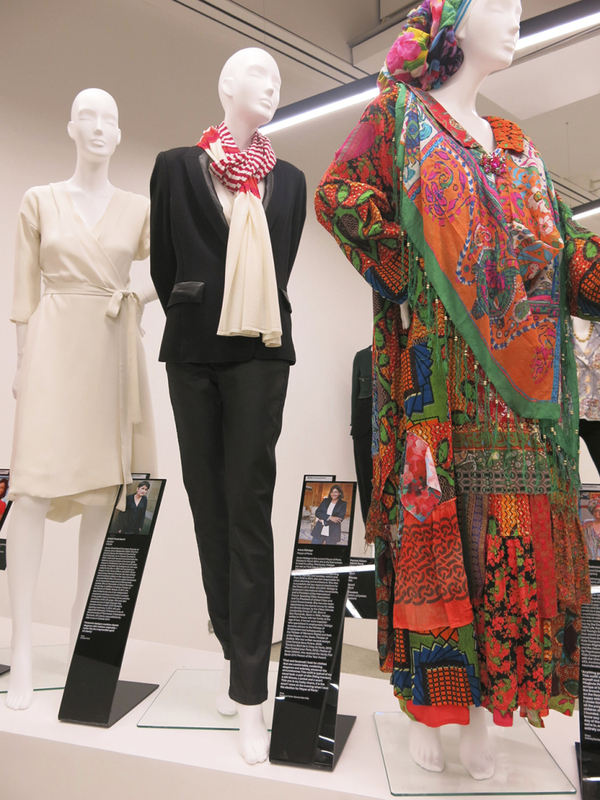 The exhibition was opened by the first ever female Mayor of Paris, Anne Hidelgo, whose chosen outfit (below centre) is by Georges Rech. At a question and answer session she bemoaned the lack of female role models in her milieu, though she admires Hilary Clinton for her charisma and political commitment – and Michelle Bachelet, the President of Chile. There was no mention of Angela Merkel. The show’s design was overseen by Zaha Hadid, whose cream Prada cape is one of the more stylish pieces on display. 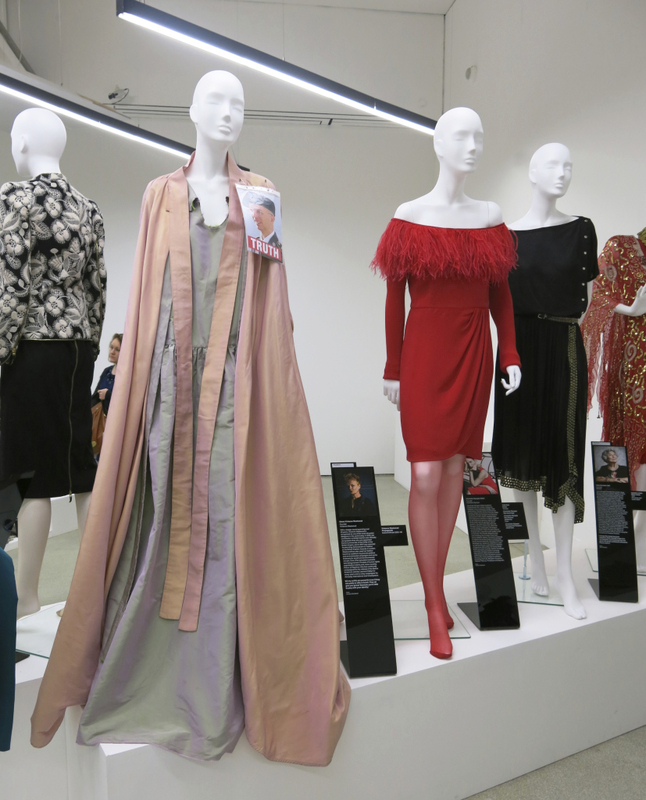 The exhibits are surrounded by a timeline of clothing, artefacts and ephemera, focusing on women’s fashion – from the boned corsets of the nineteenth century to the statement Louboutin heels of today. Exhibits include items worn by Suffragettes, Land Girls and other women in the workplace. 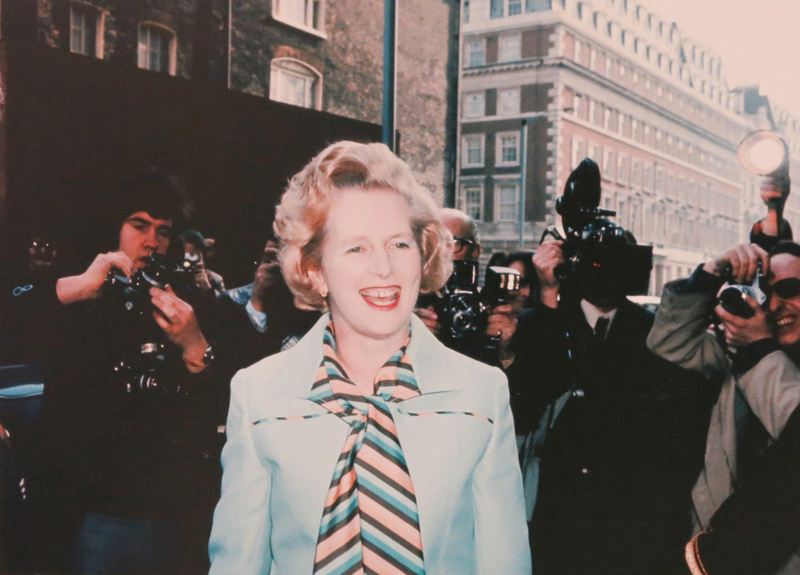 The blue Mansfield suit worn by Margaret Thatcher when she was elected leader of the Conservative Party in 1975, and a Jacques Azagury dress worn by Princess Diana on her 36th birthday, are on show – as are power shoulder pads by Thierry Mugler and Versace – and one of the first Diane von Furstenberg wrap dresses. A case could be made that some clothing is imbued with its own special power. Livia Firth, Creative Director of Eco-Age says “ethical fashion empowers you: when you wear it you are also wearing the beautiful stories of the people who have made those clothes.” The dress she has chosen is from Stella McCartney’s 2014 Green Carpet Collection. It is handmade not in India, Pakistan, Bali or Bangladesh, but with embroidered lace in organic cotton yarn made in France and Switzerland, and GOTS organic silk from German and Italian mills – inspired by recycled archival print fabric. Founder and Director of Kids Company, Camila Batmanghelidjh’s dress is a “collage of cotton,” – fabric given to Camila by friends and the children at Kids Company. “Anything goes if it makes you happy,” she says. “ This outfit was designed jointly by myself and the lady that sews for me, Magbule Mulla.” When Camila tires of her dresses, she simply cuts them up and recycles into a new collage. 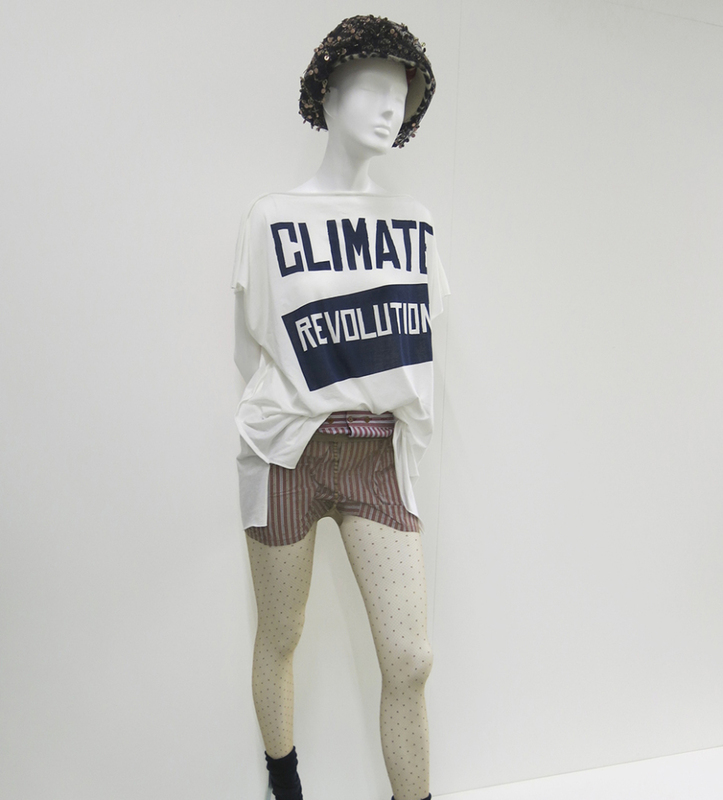 Aside from sustainability and environmental concerns, clothing can also be used to make a political statement. As a Trustee of Liberty, Patron of Reprieve, campaigner for Amnesty International and Greenpeace, Dame Vivienne Westwood uses her fashion brand as a platform to promote the causes she vehemently believes in. 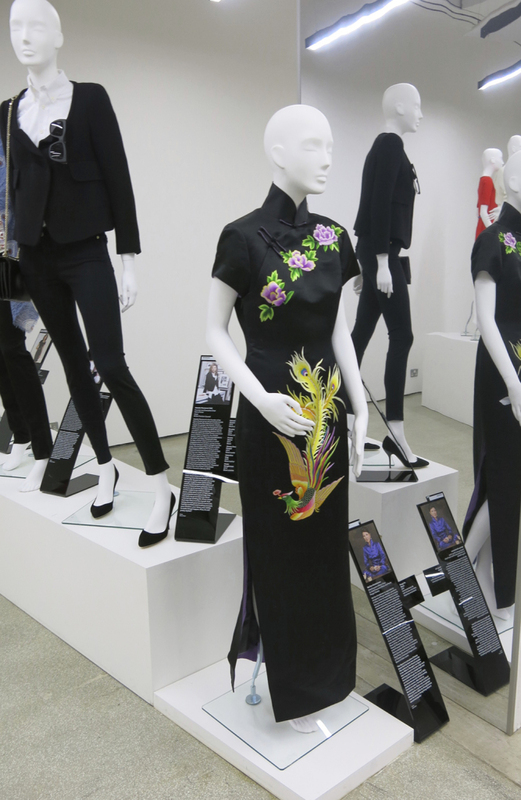 Wei Sun Christianson, CEO of Morgan Stanley’s Asia Pacific and China divisions has picked a 2004 handmade black silk dress with intricate embroidery of peonies and a phoenix. “The Qipao is a Chinese dress that has been worn since the 17th century by the Manchu people… In 1929, the dress became the official evening dress for women, worn on formal occasions. During the Cultural Revolution, the Qipao was condemned as bourgeois, a symbol of a capitalist lifestyle.” But the Shanghainese took the dress to Hong Kong, where it remains popular to this day. Surprisingly, there is little mention of the biological status of women in this exhibtion. Is being born a woman enough in itself to warrant being considered lower in the power stakes? A patent for the first bra, punk and protest t-shirts, Jane Fonda’s workout wear and male inspired ‘smoking’ suits feature, but there do not appear to be any maternity dresses on show. Even former Olympic swimming champion Princess Charlene of Monaco will have to swap her trademark Akris dresses for something a little less ‘racy’. But how many designers are prepared to embrace the diverse and physiologically changing states of womanhood? A recent study by economists Moshe Hazan and Hosny Zoabi indicated that women with high-powered careers are increasingly likely to have large families. Judging by by the UK’s Nicola Horlick and Helen Morrissey this rings true – even Madame la Maire has three children. If reproductive capacity is no longer considered a hindrance to women’s ability in the workplace, will maternity wear have a part to play in power dressing? Are women empowered or disempowered by fashion? Kim Kardashian uses fashion as a tool for gratuitous self-promotion, and she has also cleverly launched her own clothing brand. Victoria Beckham gives the impression of being a slave to fashion, though she too has created her own fashion label. Both women also make a statement via their distinctive body shapes and how they use fashion to accentuate their look – a strategy some may think demeans women’s credibility. Both women have also placed children and family life at the centre of their impeccably orchestrated marketing machines, demonstrating that women can have it all and be successful in their own right. 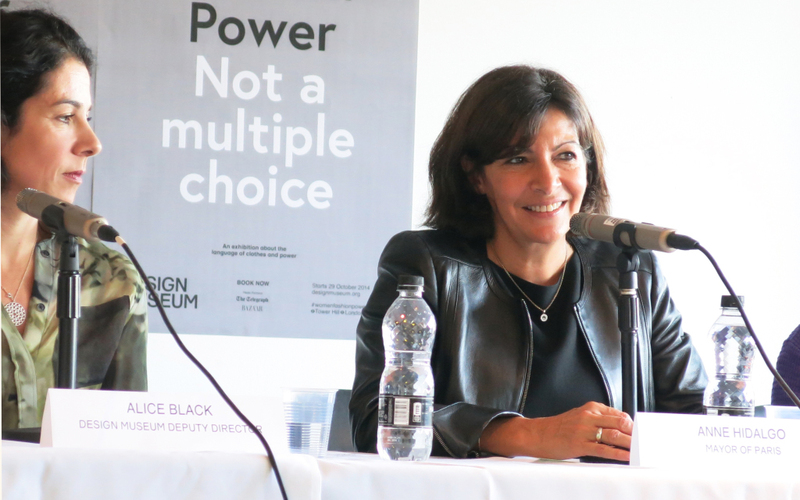 Finally, one area not fully explored by the Design Museum is the potential use of interactive high-tech design. Will female CEOs of the future be able to hypnotize their male employees or out-manoeuvre their male competitors via their micro-chipped or nano-technology enabled outerwear… or underwear? Male CEOs beware. Women Fashion Power starts today and runs at the Design Museum until 26th April 2015.